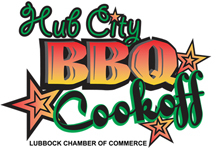 September 22….16th Annual Hub City BBQ Cook-off - Last year, over 7,000 people experienced some of the best BBQ on the South Plains as over 110 cooking teams competed for bragging rights of the best BBQ. This year the Hub City BBQ Cook-off is proving to be the biggest one yet! There are close to 100 cooking teams ready to claim bragging rights on the best BBQ on the South Plains. This year’s entertainment will be headlined by popular Texas Country music artist, Zane Williams. Opening will be the School of Rock, with local musicians playing good ol’ rock 'n' roll. Tickets are $25 for adults and $15 for children 6-10 and can be purchased at the Chamber offices at Select-A-Seat locations and online at www.selectaseatlubbock.com. Tickets will be available at the gate on the day of the event for $30 for adults and $15 for children 6-10. There is no charge for children five and under. Held in downtown Lubbock on Broadway between Avenues Q and M, and just west of the Wells Fargo Center between Main Street and Broadway Ave; 5 – 8 p.m.
September 23….Hitsville: The Sound of Motown - Many of the greatest all-time hits in popular music were created in a small, converted house in a residential street in Detroit, Michigan. Founded by Berry Gordy in 1959, the Motown record label was established and the recordings made in this studio became legendary...spawning such talents as Diana Ross and the Supremes, Stevie Wonder, The Jackson 5 and so many more. Join the Rhythm Machine and the super-talented lineup, including: Addie Bleu, Avery Guyear, Baby Jade, Butch Avery, Craig Elliot, Lauren Gallagher, Haley Simpson and Sheena Fadeyi - for an ALL NEW production as we journey back to this magical time to present the great sounds that defined the era. You'll hear classic songs like "My Girl", "I Heard It Through The Grapevine", "What's Goin' On", "Superstition", "Dancing In the Street", "You Can't Hurry Love" and many more. Reserved floor seats $20; standard balcony seats only $15. Please contact the box office at 806-762-3233 from 3:00 - 5:30 p.m. Monday-Thursday or (3:00 p.m. to showtime on the performance date or purchase online 24/7 at cactustheater.com. 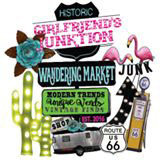 Cactus Theater, 1812 Buddy Holly Avenue; 7:30 p.m.
September 23 - 24….Girlfriend’s Junktion Wandering Market - Girlfriends Junktion Wandering Market™ is a fun and fabulous shopping extravaganza showcasing an eclectic blend of Modern Trends & Fashion boutiques, Artisan one-of-a-kind Design boutiques, Vintage and Home Decor boutiques and more! Admission $5.00 (under 12 free). Lubbock Memorial Civic Center, 1501 Mac Davis Ln; Noon - 7 p.m.
September 23 - 25…..LCT Presents: Once Upon a Mattress - If you thought you knew the story of “The Princess and The Pea”, you may be in for a walloping surprise! Did you know, for instance, that Princess Winnifred actually swam a moat to reach Prince Dauntless the Drab? Or that Lady Larkin’s love for Sir Harry provided a rather compelling reason that she reach the bridal altar post haste? Or that, in fact, it wasn’t the pea at all that caused the princess a sleepless night? Carried on a wave of wonderful songs, by turns hilarious and raucous, romantic and melodic, this rolling spin on the familiar classic of royal courtship and comeuppance provides for some side-splitting shenanigans. Chances are you’ll never look at fairy tales quite the same way again. Tony Nomination for Best Musical, Best Leading Actress in a Musical with Carol Burnett as Winnifred, Tony Award for Best Revival of a Musical with Sarah Jessica Parker as Winnifred. Musical Comedy Rated: G. Music by Mary Rodgers. Book by Jay Thompson, Dean Fuller, and Marshall Barer Lyrics by Marshall Barer. You can purchase your tickets on-line at lubbockcommunitytheatre.org or by calling the office at (806) 749-2416. Lubbock Community Theatre, 4230 Boston Ave; Friday and Saturday: 7:30 p.m. and Sunday: 2 p.m.
September 23 - 26….Friends of the Library Sale - Friends of Lubbock Libraries will open the basement of Mahon Library on September 23rd for FOL members and on September 24 to the public. Shelves have been restocked with many thousands of recent donations. Books, DVD’s, CD’s, VHS & LP’s are available in EVERY category. Areas are arranged by: Fiction sorted into usual categories, Large Print, Children’s, Arts and Sciences, Educational, Religious, History, Cookbooks, Hobbies and Games, Business, Computers, Comics and much more. New and Used Book Sale from $.25 to $10 + Cash, checks as well as credit cards are now accepted. Memberships available at the door: Individual/ Family $10, Patron $25 to $100, Student $5. Mahon Library, 1306 9th St; Friday September 23 9 a.m. to 5 p.m. (FOL members only), Saturday September 24: 9 a.m. to 5 p.m., Sunday September 25:1 to 4 p.m., Monday September 26:3-7 p.m.
September 24….Lubbock Downtown Farmer’s Market - Held each Saturday, June through October, this unique gathering of area producers, specialty food and beverage providers and select artisans specializing in homegrown or homemade. Held in the Depot District area, this weekly event has become a highlight of the summer months and offers something for everyone. Support your local growers and be part of the "locally produced" movement. Be there at 9 a.m. – produce is available until vendors sell out! Tornado Gallery,1822 Buddy Holly Avenue; 9 a.m.
September 24….Children's Home of Lubbock Annual Fall Festival - Features will include inflatable games, Leon Pinkert with his horse-drawn carriages, a barbeque meal (lovingly served-up by Gus and Phyllis Menendez), our children's parade (hayride, carriage, train, tractor, bicycles, floats, fire engine and other interesting vehicles), a wonderful silent auction and bake sale. Last year we had Rick & Suzanne Ward's Olde-Time Popcorn Truck in our parade and giving out goodies all day. Also...R2-D2, some Jedi Knights, and other Star Wars characters could be found around campus. Live entertainment provided by: Lone Prairie. Children always enjoy the rides and inflatable games...and the parade is, as always, a BIG hit... featuring floats designed by our cottages in addition to the Roosevelt Eagle Marching Band! Adults especially enjoy the HUGE silent auction benefiting the Home. One of the highlights of the day is the auctioning of several home-made pies, made with delicious 'children's home' pecans. Mmmm, those pies are good! 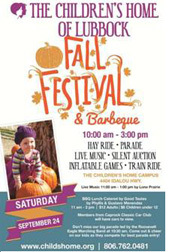 The Annual Fall Festival is held on the campus of The Children's Home of Lubbock each September. In addition to being a fund-raiser, this event serves as an opportunity for our friends and supporters to enjoy our beautiful campus and get to know students and staff. Children’s Home Campus, 4404 Idalou Hwy; Festivities will begin with the "Big Parade" at 10:30 a.m. and activities will last until around 3 p.m.
September 24….The Roundtable presents: Becky Critz High Point Village - "No Limits, No Boundaries" - Our luncheons are held at Hillcrest Country Club 4011 N Boston Ave, Lubbock. North on University past State Living Facility to Newcomb, left for about 4 blocks and you will come to the entrance of the Hillcrest Country Club at Boston and Newcomb. Meeting Format: People arrive about 11 a.m. to start registering, pay for lunch and some socializing. Food service starts at 11:15 followed by introductions and announcements at 11:30. The speaker will start about 11:50 and be finished with the program and questions from the audience by 1 p.m.The public is invited. Lunch/attendance is fifteen dollars ($15) per person. Limited menu includes beverage and dessert. There are no membership fees or dues associated with attending the functions. Any extra monies that you would like to contribute will go towards the speakers lunch and towards our Honors College Scholarship fund at Tech. Our Saturday luncheons are a great way to (1) learn more about current global/US/Texas/Lubbock issues and events, (2) meet other people in area who may become lifetime friends (3) feel more at home in Lubbock. Most wear business or business-casual attire. No RSVP is necessary. Show up whenever your schedule allows, feel free to bring a guest(s) and email this invitation to anyone you think might be interested. For more information email Marie Evans at this address: mevans1398@aol.com. September 24….The Life and Art of Vincent Van Gogh with Christian Conrad - Saturday Lectures at LHUCA is an informal conversation over the life and work of contemporary artists. It’s a stress-free opportunity to examine the art and ideas that underlie much of the modern art world. Attendees are encouraged to ask questions and join the conversation. This event is free to the public. Coffee and donuts served! For more information visit www.lhuca.org. LHUCA, 511 Ave K; 11:30 a.m. – 1 p.m.
September 24….Heroes for Horses – This is the biggest fundraiser of the year for Join Easy R Equine Rescue. All proceeds go directly to the costs of rescuing and rehabilitating the horses who come to Easy R. Chad Prather, motivational speaker, television personality and humorist will be the host/emcee for the event and is sure to bring lots of laughs. There will be a catered dinner by Heart and Soul Cuisine, entertainment by Gary Nix and West! Texas, a silent auction and a raffle. Tickets for (13+): $50 and children (12 & under): $35. To reserve tickets visit www.easyrequinerescue.org. Eberley Brooks Event Center, 8602 County Road 7000(FM 179 and 66th Street); 6:30 p.m.
September 24….Sounds of West Texas Classic Music Concert - This show will feature fantastic local talent performing "Signature Songs" from classic country, soft/classic rock, pop nostalgia, folk and gospel musicians. The Sounds of West Texas show is unique in that lucky audience members can win door prizes, some of the performers sing jingles from some of the businesses that sponsor, and the audience will enjoy a wide variety of some of the best songs ever written! This is a show that is fun for the whole family. Featured performers will be: Larry Allen, Kaci (Keltz) Brice, Steve Burrus, Lesley Carraway, Mike Carraway, Rian Castillo, Ray Espinoza, Richard Houston, Mike Huffman, Hannah Jackson, Darryl Lippe, Donnetta Lippe, Donnie Martin, Johnny Richardson, Betty Smith, Brent Smith, Keith Smith, Mark Wallney, and Terry Westbrook. The emcee will be Darryl Holland (new owner of the Cactus Theater). There will be reserved seating only. Tickets are $20 or $15 and can be purchased online (by clicking on the exact seats you want and purchasing right then) at the Cactus Theater website: cactustheater.com or can be purchased at Cactus Theater box office by phone, or in person. The box office is open 3 - 5:30 p.m. M-Th and 3 - 9 p.m. on Fri and Sat (when shows are going on.) Tickets may also be purchased at the door the night of the concert. The phone number to call to reserve tickets is: 806-762-3233. Cactus Theater, 1812 Buddy Holly Avenue; The doors will open at 6:15 and this classic music concert will begin at 7 p.m.
September 26….Concert Band & Symphonic Band Concert - Serious attitude and delicate gentility will share the stage during this evening of wind band music. The Concert Band will be bookending the uproarious Stomp with a suite of Renaissance dances and a two-movement work inspired by four pointillistic paintings by Georges Seurat. The Symphonic Band will pair Percy Grainger’s whimsically eclectic settings of folk tunes from the British Isles with two powerful exhortations of wind band writing: Eric Whitacre’s seasonally evocative October and Vaclav Nelhybel’s triumphant Trittico, a staple of band literature. Free, and open to the public. Hemmle Recital Hall, Texas Tech University; 7:30 p.m.
September 23 – October 1….99th Annual Panhandle South Plains Fair - Don’t miss all the excitement at the Fair featuring free exhibits, petting zoo, free shows, livestock competition, lots of food and rides. Admission: Adults, 13 and over $10.00, Youth, ages 2 – 12: $5.00, Kids, ages 1 and under: Free, Parking $5.00 per car. For all the details call 1-806-763-2833 or visit www.southplainsfair.com. The Fairgrounds are located on the northeast corner of Broadway and Ave A. Carnival Hours of Operation: Monday – Thursday: 3 p.m. – 11 p.m., Fridays: 3 p.m. – Midnight, Saturdays: 11 a.m. – Midnight Sunday: 11 a.m. – 11 p.m. Fair Hours of Operation: Sunday – Thursday: 8 a.m. – 11 p.m., Fridays: 8 a.m. – Midnight, Saturdays: 8a.m. – Midnight. Now through November 12….The Maize – Lots of fun awaits you at the Atldo Farms Corn Maize as they celebrate their 16th season. 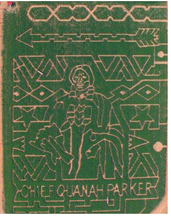 This year’s maize features Quanah Parker. Admission is $10 (4 & under are free) and includes maze or kid maze, hayride to pumpkin patch, hayride to Pumpkin Hollow after dark, cow train, corn cannon (3 shots) and barnyard. With military or college ID - $2 off, senior citizen - $2 off, group rates: $8. The regular maze can be a little overwhelming so they have created a special trail through the corn for families with younger kids. Along the journey you will be reading story boards of "Young Quanah & The Rabbit". It will be a fun adventure! Take a hayride out to the patch, stroll through the vines and pick your perfect pumpkin. Many varieties to choose from. Prices range from $1-$20. Hayride to pick pumpkins stops at dusk. As soon as the sun sets each evening the hayride to Pumpkin Hollow begins! 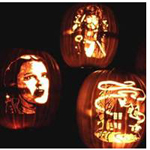 There are over 150 carved pumpkins with designs from Disney characters, Star Wars, Peanut Characters, Famous people, and American theme and much more. New pumpkin designs this fall created by Eileen Martha. Come see the illuminated pumpkins by the harvest night sky. The Windmill Grill & Bakery will be open and serving up Maze favorites such as brisket , regular sausage and jalepeno sausage wraps, hamburger/cheeseburger, Frito pie, fresh Apple Blossom, gourmet brownie, homemade pumpkin bread, frozen treats, spiced cider, hot chocolate, refreshing drinks and our famous corn suckers. You can also reserve campfires - $30( Call for reservation- 763-5594). Horse rides - $5 (Saturday & Sunday until dusk). The At'l Do Farms Corn MAiZE is located 3/4 of a mile west of Frankford Ave (FM 2528) on FM 1294. GPS address: 6323 FM 1294 Lubbock 79415 (you must enter the zip! ); Closed Mondays. Open Tuesdays- Fridays 6 – 9 p.m., Saturdays 10 a.m.- 9 p.m., Sundays 2 – 9 p.m. and By Reservation: Tuesday- Thursday 9 a.m.- 3 p.m.( school field trips). Answer: "I'll Never Smile Again"
Question #2: In 2001, the airport serving New Orleans changed its name to honor one of the city's most famous residents. Who received that honor? This Week's Twin Trivia Contests! For this contest, 1 winner will receive a Family 5-pack to the Atl'do Farm Corn Maize. Includes Admission for 5, hayride for 5, Cowtrain for 5 and corn cannon for 5. Valid Sept 17th – Nov 12th. To win these tickets, correctly answer the trivia question below and email it to us at info@lubbockfunclub.com using the fun phrase "Corn-fed Contest " as your subject title. The Question (in the form of a RIDDLE this time): First you throw away the outside; then you cook the inside; then you eat the outside; and then you throw away the inside. What am I? The deadline for this contest is Friday (tomorrow!) at 10 a.m. and the winner will be contacted shortly thereafter. Please provide a daytime phone number where we may contact you if you are the winner. Question #2: For this contest, 2 winners will each receive 2 tickets to the “Sounds of West Texas Concert” this Saturday night at the Cactus Theater (showtime is 7 pm). To win these tickets, correctly answer the trivia question below and email it to us at info@lubbockfunclub.com using the fun phrase "Sounds Like A Winner To Me" as your subject title. The Question: What song - not connected to West Texas artists but rather recorded by a classic rock group - was recently voted the "happiest song" (or most "feel good" song) recorded in the past 50 years?